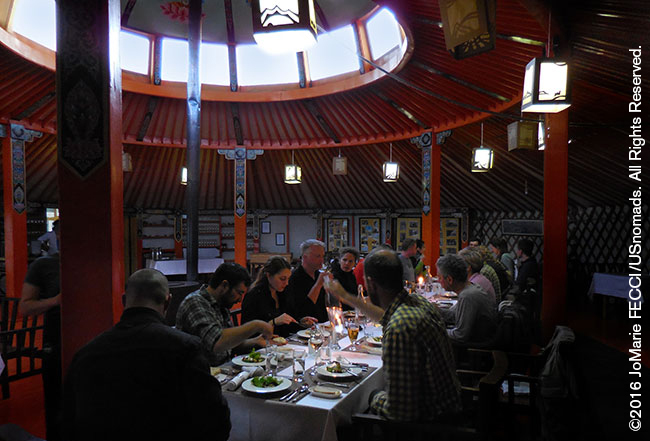 JoMarie Fecci, of USnomads, joined an international team in a 1,400 mile working expedition to Mongolia, in May-June 2016. 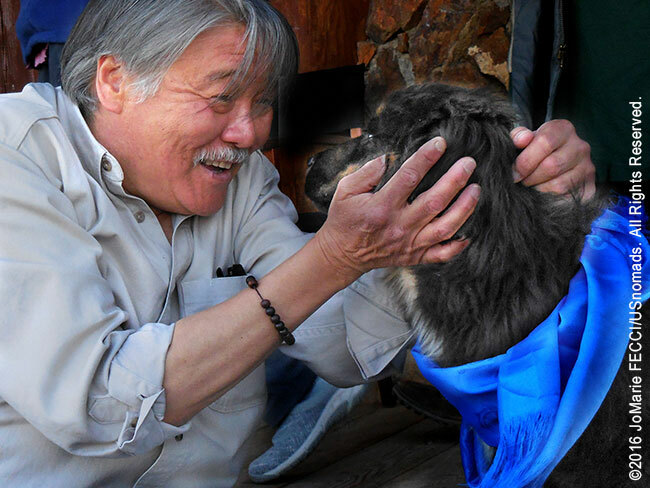 The trip, led by Overland Experts founder Bruce Elfström, was providing support for The Mongolian Bankhar Dog Project, an NGO which aims to help save a way of life for the nomadic herders in the Gobi desert while simultaneously protecting a fragile environment. 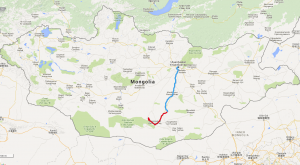 The route was a loop deep into the south Gobi then west into the Altai mountains and back north to Kharhorin before returning east to Ulaanbaatar. The sky was clear and there was not too much wind as we picked up a dirt track across some small hills in the direction of Tsagaan Suvarga, or the “white stupa.” They say this rocky formation can look like a ruined city when seen from a certain distance. It definitely seemed wild and mysterious as we approached, rising out of the flatness of the desert like a stone mirage. The rock walls were sculpted by wind. The Mongolian steppe sits atop an elevated plateau in the heart of the north-Asian wind channel, making the wind a powerful force. The whole character of the land is shaped by it. Desert sand is blown away leaving the bare gravely terrain so typical of the plateaus. And where wind meets rock, it works its magic, producing incredible works of art in colorful cliffs and delicately carved spires. 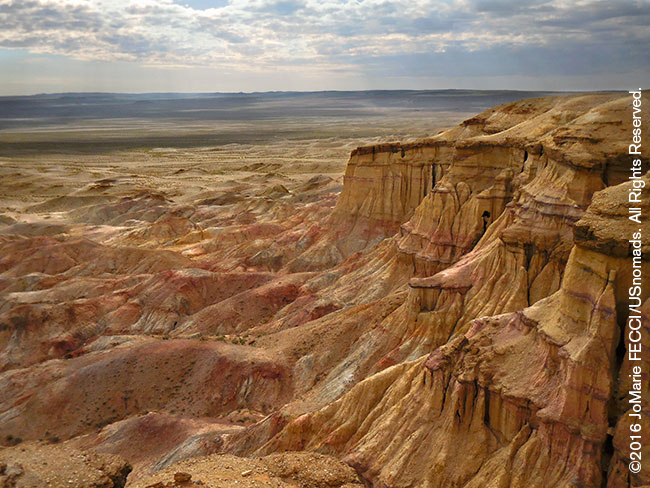 The formation at Tsagaan Suvarga is almost 200 feet high and over 1,000 feet wide and the different color layers actually reveal the sedimentary structure of an ancient sea bed. The rainbow effect comes from the way different ores reacted as they were exposed to oxygen. We were able to drive right up to the top of the cliff edge where we stopped for a short break to explore. 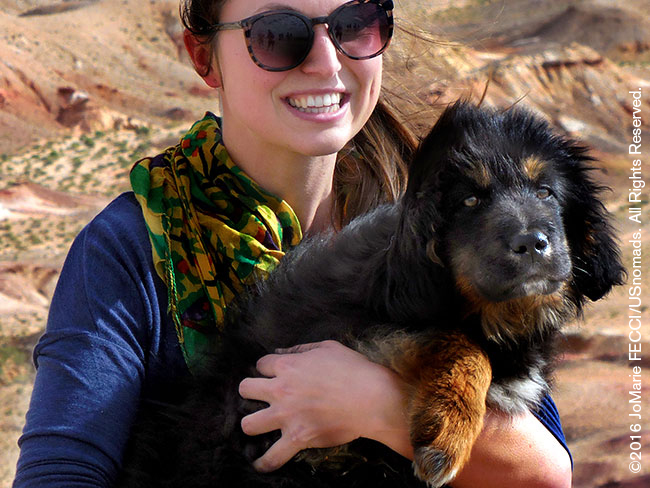 The convoy was transporting a Mongolian Bankhar Dog Project puppy to his “forever home” in the south Gobi where he will be fulfilling a very special role as he grows and learns. The team had named him “Blaze” but when he is welcomed into his new home, he will receive a Mongolian name. His new owners were waiting for his arrival and had prepared a traditional ceremony to welcome him, so we couldn’t disappoint. Blaze still had 180 more miles to go. We rolled on deeper into the desert, heading southwest another hundred miles, eventually returning to the tar road and crossing into Ömnögovi, or “South Gobi,” province. As we approached the provincial capital of Dalanzadgad we could see the Gurvan Saikhan mountain range in the distance. “Gurvan Saikhan” means “three beauties,” a reference to the three subranges: Baruun Saikhany Nuruu (the Western Beauty), Dund Saikhany Nuruu (the Middle Beauty) and Zuun Saikhany Nuruu (the Eastern Beauty). Their dark blue sihlouette cut into the light blue sky, creating a perfect backdrop for some camels. The sight of animals grazing on the outskirts of town had become unremarkable, and no one was calling out wildlife sightings on the radio anymore. Ömnögovi is rich in mineral deposits, including gold and copper, and “DZ,” as the capital is nicknamed, has grown rapidly due to the nearby Oyu Tolgoi mining operation. It is a somewhat sprawling and ordinary looking modern town, with shopping, restaurants and a few large hotels, but does not seem like a “tourist destination” in and of itself. Most tourists who come here just stop to stock up on supplies for excursions to the touristic sites further south. We were doing the same. Gas tanks full, we left the tar road behind for good. The desert spread out alongside the mountains that now clearly marked our route from east to west. It was flat and dusty and the washboarding made our teeth rattle a bit until we figured out our optimal speeds. The convoy was made up of several vehicle types that had different “comfortable” cruising speeds on this terrain. 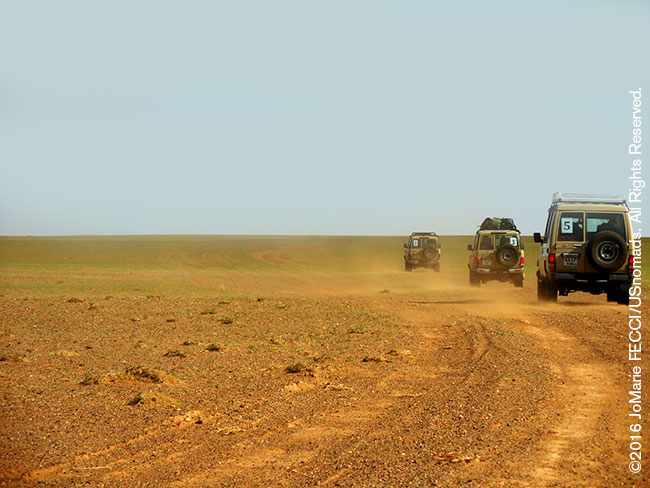 We staggered out across the vast expanse of the Gobi stretching to the limit of our radio contact. There was no concern about getting “lost” as the tracks were clear and straight and we could see the dust cloud of the vehicle ahead from quite a distance. The terrain was easy driving. 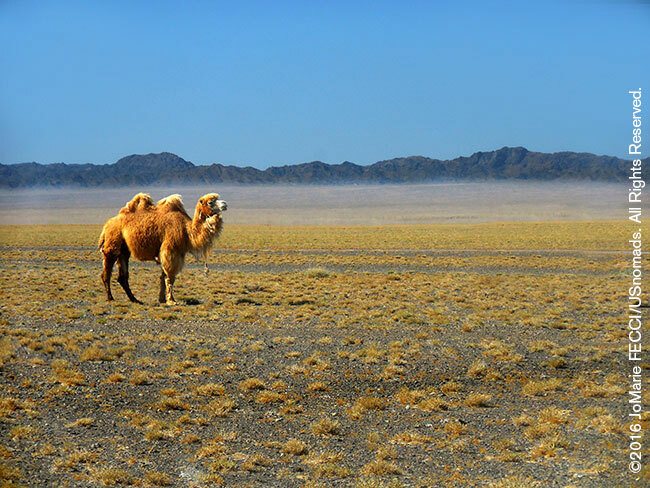 Unlike the Sahara, with its massive “seas” of sand dunes, the Gobi is mostly large barren stretches of gravel plains and rocky outcrops, with just a small percentage of sandy desert. Hidden in plain sight are some remarkable finds. Roughly sixty miles from DZ the tracks converged on a red rock formation known as the Flaming Cliffs. These sandstone cliffs turn a bright orange-red at sunset, but their bigger attraction for many visitors is the dinosaur hunt. 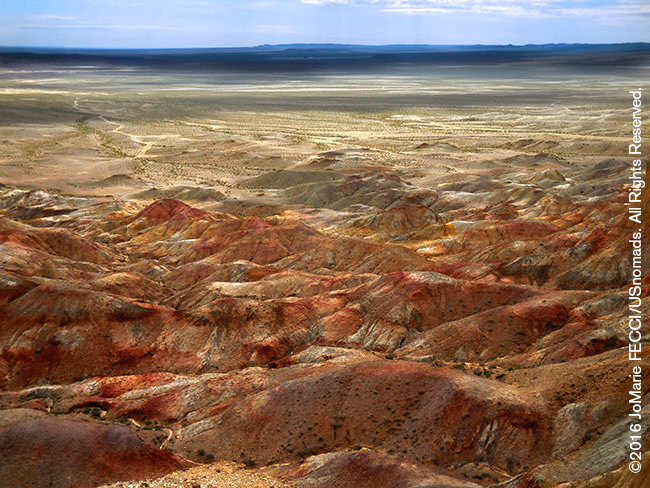 The area, known as Bayanzag in Mongolian, is a treasure trove of fossils. The first dinosaur eggs were discovered here in the 1920s by American paleontologist Roy Chapman Andrews, who spent two years searching the area for evidence of the prehistoric creatures. Chapman famously delivered the results of his work, including a large dinosaur skeleton, to the museum in UB via a 70-camel caravan. Paleontologists continue to research the ancient sea bed here, and many more fossils have been uncovered since. The Flaming Cliffs are one of the major attractions in the area, and there is organized tourism, but visitors are free to walk around and explore on their own. 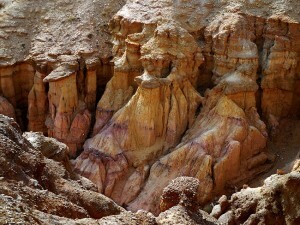 There is a hiking trail along the ledge that goes down along the sandstone walls and loops around through the formation. We stopped to spend a little time just appreciating the desolate beauty of the red rock under the endless blue sky before continuing the last twenty miles to the Three Camel Lodge. A discreet signpost indicated our arrival at the lodge, and a mixed herd of animals spilled out into the road. We could see four of the “five snouts” in the crowd — horses, sheep, cows, and goats. Ironically, there weren’t any camels in the group. Cited by National Geographic as one of the world’s best ecolodges, the Three Camel Lodge seemed like a surreal island of luxury tucked in behind the shelter of a gentle hill. And yet, this opulent interpretation of the traditional nomadic compound is “sustainable” and eco-friendly, utilizing solar energy, recycling gray water and training local farmers in organic agriculture techniques. The story of the lodge is an interesting tale of balance. 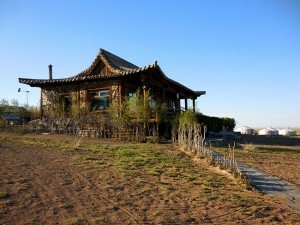 It was conceived by founder Jalsa Urubshurow as a way to enable controlled tourism while simultaneously protecting the Gobi desert environment. Jalsa has served as an advisor on tourism development and environmental protection to the government of Mongolia since the start of the democratic regime in 1990, and his expertise enabled him to put together a perfect mix of tradition and modern, creating something truly unique. The lodge provides guests with an authentic travel experience by fostering an exchange that brings the local community and the visitors together in a symbiotic relationship, encouraging environmentally sound practices and respect for the desert. Jalsa himself greeted us as we gathered in the lodge’s main building which is modeled on Buddhist temple architecture. He had everything prepared for the naming ceremony to welcome the Bankhar pup to his new home. As with many things in Mongolia, there is a lot of tradition surrounding these dogs. Bankhars are thought to be “of the same spirit” as humans and dogs are the only animals that are given names. When a new dog joins a herding family the family will feed it milk (sometimes milk is sprinkled on the dog) and whisper its name into its ear. Traditionally milk is thought to bind the dog to the soul of the family; the life blood in a way. The name is given in a whisper so as not to draw the attention of evil spirits who might give bad luck or cause the dog or family harm. Barbos quickly settled into his new surroundings where he will be performing a dual role. In addition to helping to protect the livestock, he will be an “ambassador” of sorts, introducing guests to the story of the Bankhar and serving as a teaching model for the project in the region. 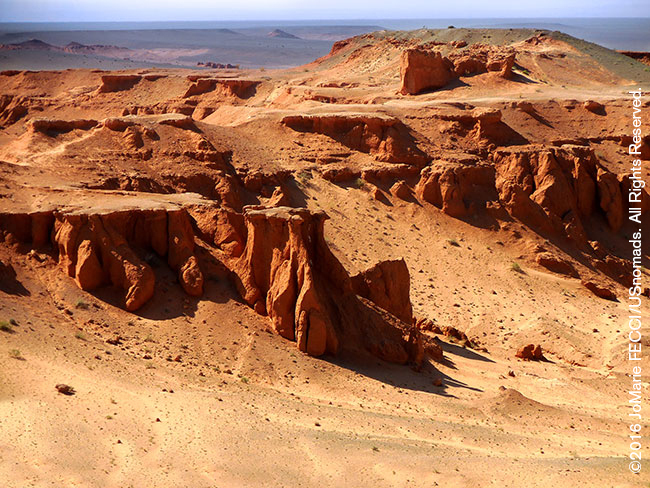 TSAGAAN SUVARGA TO THREE CAMEL LODGE: From camp we will take a dirt route through the desert to the impressive cliffs of the Tsagaan Survarga site just five miles, before picking up the route southwest for roughly 100 miles to Dalanzadgad. We return to the tar road for a bit before arriving there to re-fuel. 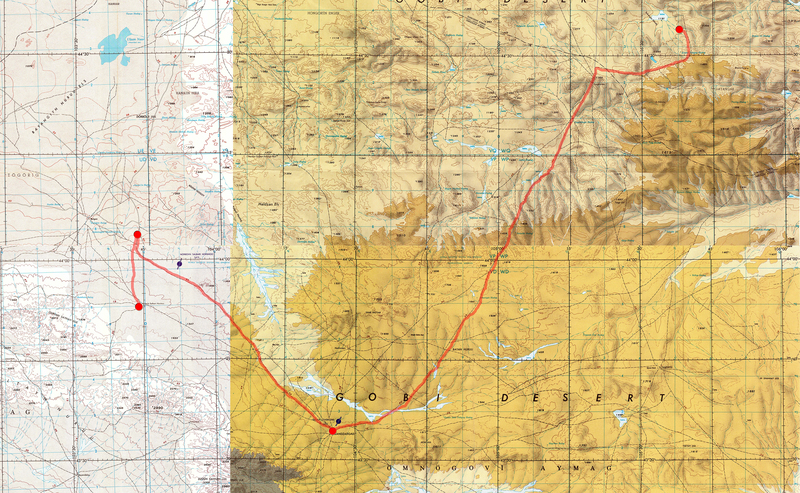 DZ is also where we turnoff onto dirt again for most of the rest of the journey. We follow the contours of the mountain range heading west for about 60 miles. Driving and navigation will be easy on this straight stretch, though the washboard roads will be pretty uncomfortable in spots. We make a detour to the Flaming Cliffs at Bayan Zag to stop and explore a bit, then finish the day’s drive the last 20 miles to the famed Three Camel Lodge. Mongolia’s terrain is one of mountains and rolling plateaus, with a high degree of relief. Overall, the land slopes from the high Altai Mountains of the west and the north to plains and depressions in the east and the south. The landscape includes lakes, marshes, sand dunes, rolling grasslands, alpine forests, and permanent montane glaciers. The country has three major mountain ranges. The highest is the Altai Mountains, which stretch across the western and the southwestern regions of the country on a northwest-to-southeast axis (the Gurvan Saikhan mountains are part of the Altai range). The Hangayn Nuruu, mountains also trending northwest to southeast, occupy much of central and north-central Mongolia. These are older, lower, and more eroded mountains, with many forests and alpine pastures. The Hentiyn Nuruu, mountains near the Russian border to the northeast of Ulaanbaatar, are lower still. 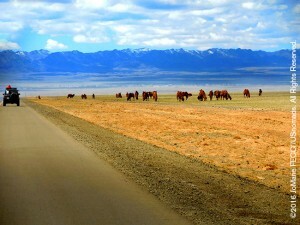 Much of eastern Mongolia is occupied by a plain, and the lowest area is a southwest-to-northeast trending depression that reaches from the Gobi region in the south to the eastern frontier. The rivers drain in three directions: north to the Arctic Ocean, east to the Pacific, or south to the deserts and the depressions of Inner Asia. Although it can create some beautiful landscapes, Wind erosion can also be a serious environmental problem. It is a common phenomenon occurring mostly in flat bare areas, dry sandy terrain or anywhere the soil is loose, dry, and finely granulated. Soil movement is initiated as a result of wind forces exerted against the surface of the ground. For each specific soil type and surface condition there is a minimum velocity required to move soil particles. This is called the threshold velocity. Once this velocity is reached, the quantity of soil moved is dependent upon the particle size, the cloddiness of particles, and wind velocity itself. There are three types of wind erosion. “Suspension” occurs when very fine dust particles are lifted into the wind. Once in the atmosphere, these particles can be carried very high and be transported over extremely long distances. “Saltation” is when fine soil particles are lifted into the air by the wind and drift horizontally across the surface increasing in velocity as they go. This is the most common way soil is moved by the wind. Saltation can cause severe damage to the soil surface and vegetation. “Creep” happens when particles which are too heavy to be lifted into the air are rolled across the surface after being hit by particles in saltation. All three types of wind erosion damage the land by removing soil from one place and depositing it in another. It smothers crops, causes soil loss, dryness and deterioration of soil structure, nutrient and productivity losses, and air pollution. 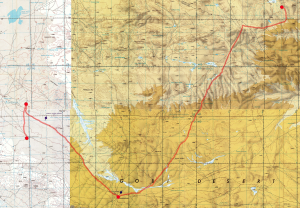 A great source for route planning and detailed topo maps of Mongolia is Perry-Castañeda LibraryMap Collection of the University of Texas at Austin. 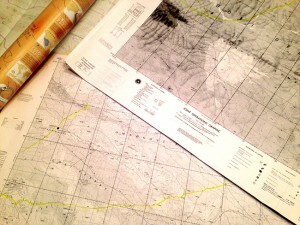 You can download 1:250,000 scale sectional topographic maps of most of Mongolia here or 1:500,000 tactical pilotage topos here. Note that these maps are “historical” and marked “not to be used for navigational purposes” but they make an excellent planning tool, as the basic topography does not change. Add to that a current road map from one of the options available here. 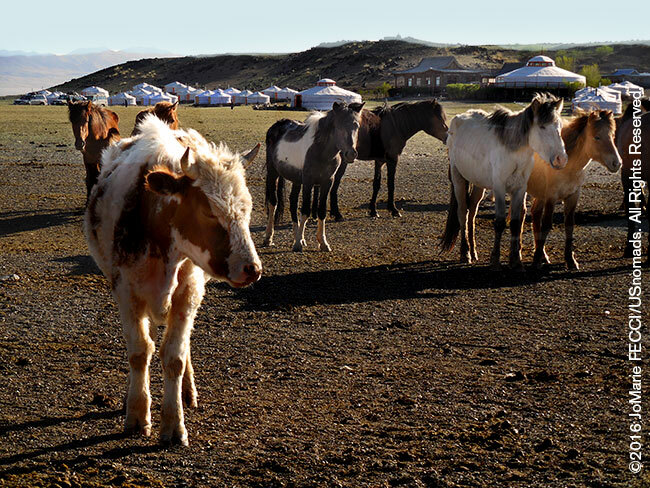 The Mongolian Bankhar Dog Project is a 501(c)3 nonprofit organization whose mission is to help slow down and reverse the desertification of the Mongolian Grassland Steppes, and to preserve and protect traditional Mongolian culture. Founded by Bruce Elfström in 2011, the MBDP works with nomadic herders in the Gobi desert to revive the traditional use of the livestock guardian dog known as the ‘Bankhar dog’. For more information, or to donate directly to the MBDP, please go to bankhar.org. To learn more about the origins of the project and its impact in Mongolia, watch MBDP founder and expedition leader Bruce Elfstöm’s TED talk video. Overland Experts provides driving and expedition management training programs for the military, humanitarian organizations, professional and recreational drivers. With purpose built trails and obstacle courses at locations in Connecticut, Virginia and North Carolina, they offer comprehensive training in a full range of vehicles and scenarios. 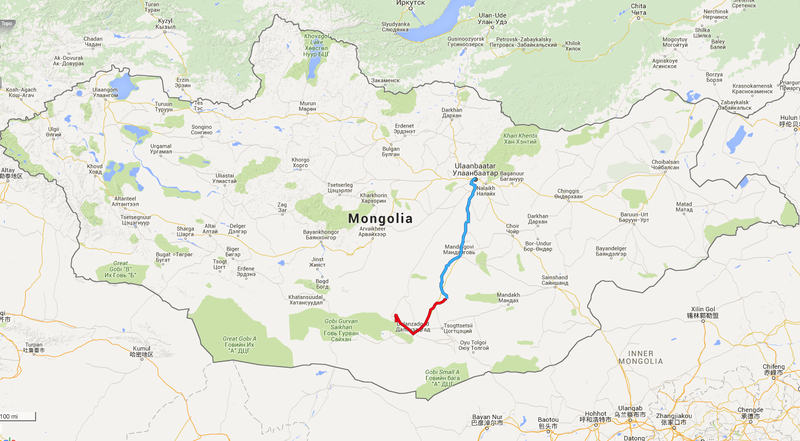 NOTE: This is the third in a series of segments highlighting locations and details of the OEX 2016 Mongolia Expedition. All text and photos are copyright JoMarie Fecci/USnomads unless otherwise noted. If you would like to use any of the imagery included here, please contact us for permission.